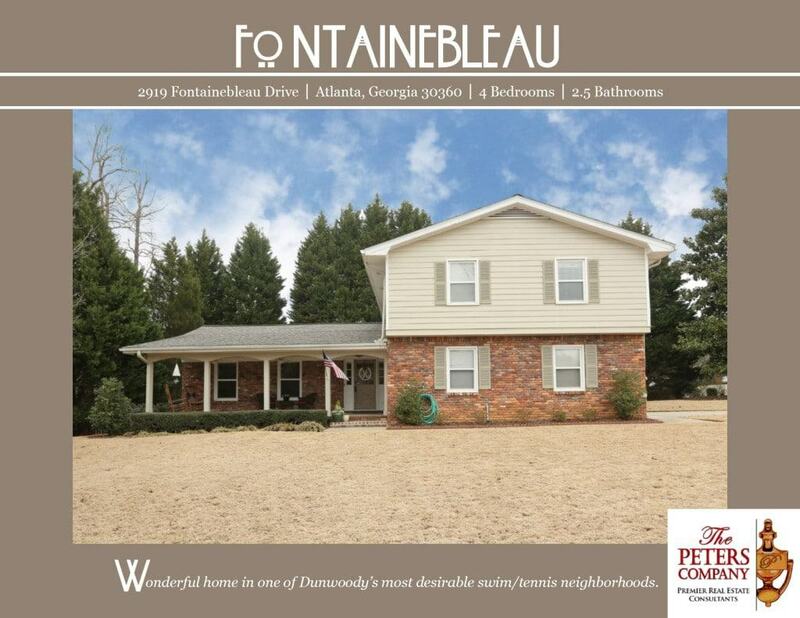 Just Listed :: Large Corner Lot in Fontainebleau Swim/Tennis! Welcome home! Nestled on a large corner lot in the well-loved Dunwoody swim/tennis neighborhood, Fontainebleau, this home is just what you’ve been looking for. The flowing floor plan, custom features, and charming character will never go out of style. The close proximity to I-285, Winters Chapel Road, and Peachtree Industrial Boulevard makes this home convenient to and from any direction. You’ll enjoy having easy access to many popular restaurants and shopping spots nearby including those around Perimeter Mall and The Forum! Kitchen features granite countertops stainless steel appliances, ample cabinet space, pantry, and breakfast area. Spacious family room boasts built-in bookcases and a cozy gas fireplace. Formal living room provides extra living space. Master suite is a true retreat including a walk-in closet and master bathroom with double vanity. Spacious garage easily fits two vehicles. Large patio leads out to the flat backyard and is ideal for outdoor enjoyment and entertaining. Wonderful location that is convenient to interstates, shopping, and restaurants. New roof (2016) and newer HVAC (2014). ← Just Listed :: Charming Woodstock Traditional!